Nov. 1962 - Employed as shipping clerk in the Export Dept. at Chubb’s London Head Office. Sept.1968 - Accepted as trainee in Lock Sales Division. at the Birmingham Branch Office. Jan.1974 - Returned to London Head Office as Lock Contracts Manager responsible for Govt. Clients and Special Contract Customers. Nov.1999 - Compulsory Redundancy/Early Retirement! locks to HM Prison Service. 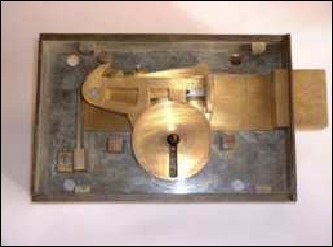 Although the range of locks had been designed to meet the security regime within UK Prisons, the products were also used by many foreign custodial services. The Chubb Company in each country acted on our behalf, raising orders on Chubb UK and arranging final delivery. locks both at home and overseas demanded most of my attention but I retained my interest in Chubb’s ‘old’ locks. 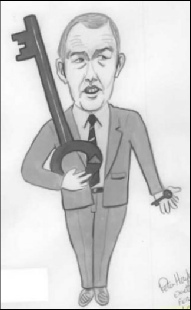 Cartoon drawn in 1985 during one of my regular lectures at a training establishment in Wakefield, Yorkshire. This 8”x 5¼” Rim Deadlock, acquired during a routine sales call in 1970, was the starting point. The Chubb Factory being ‘on my patch’ gave me access to the Locksmiths and one of them restored the lock and made new keys. When returning it he told me the Lock Record Books dated the serial number to July 1870. He also mentioned that orders for the renovation of old locks, some dating from the 1800s, were a regular occurrence. My sales training in London included ‘hands-on’ instruction in assembling the various products listed in the Lock Catalogue. Once I began calling on customers I quickly realised I still had a lot to learn. My sincere thanks to the skilled craftsmen in the ‘Locksmiths Shop’ at Wolverhampton. They pulled my leg at every opportunity but ‘twer worth it!